i have 2 ponytail palms that weren't doing well. I repotted them into one bigger pot and they don't seem any better. Right now they are outside. Please help. 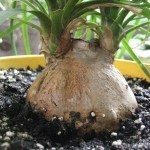 When you say that your ponytail palms are not doing well, can you provide more description on what is happening to them? What kind of lighting is it in when it is inside and outside? Tell me about how you are watering and fertilizing your ponytail palms. Are you letting the soil dry out significantly in between waterings? Are you fertilizing it the recommended 2-3 times per year? Too much water and too much fertilizer can negatively impact ponytail palms.